Peaceful Pieces Sensory Center is holding its fourth annual Laps of Love event on April 13 at Ringgold High School to raise money for a center to create socialization and learning opportunities for children with autism and other sensory-processing disorders. Peaceful Pieces Sensory Center is a dream born of a birthday wish made by Trever Arnold, who wanted help closer to home for himself and other autistic young people. From left: Trever Arnold; Angel; Hayden; Justin; volunteer Tina Boyd; Trever's service dog Balto; and Tina Boyd's service dog, Mia. Co-founder and president of Peaceful Pieces, Amber Lowe, is a social worker and Trever's older sister. She says on the group's website, "It was not until my younger brother was diagnosed with autism that I realized how few resources our community had to meet his needs. He participated in as many resources as he was able to, but somewhere there was a gap. We had no training, only insight to learn from him and do our best. Families in our area are experiencing this same need every day. My brother has become an amazing young man that I am so proud of. He has felt a strong desire to give back to those who see the world the same way he does and to support their families." "If one young man can give so much to his community," Lowe says of Trever, "we can all work together to make life a little more enjoyable for others in these situations." On April 13, Peaceful Pieces will hold their fourth annual "Laps of Love" fundraising event on the Ringgold High School football field. The public is invited to attend, walk or run laps, mingle and socialize. There will be inflatables for children, food vendors, and activity tables especially geared toward those with sensory sensitivities but also fun for all. Magician Michael Frisbee will be doing a show, and Treverini will also be performing. Peaceful Pieces is looking for sponsors for the event and offers several levels of sponsorship. They are also looking for businesses, nonprofits and healthcare providers who would like to set up booths at Laps of Love. Fort Oglethorpe Police Chief Mike Helton discusses buying radios for two recently purchased patrol cars during the Feb. 11 City Council meeting. The city of Fort Oglethorpe recently approved the purchase of two mobile radios to go in new patrol cars that are on their way. During the most recent City Council meeting on Feb. 11, Chief Mike Helton requested the equipment for the new vehicles. "Staff would like to recommend the purchase of two Motorola mobile radios for the two Dodge Chargers that you all purchased approximately a month ago," Helton said. "They're (the cars) still on order and they're on their way. Helton explained that the vehicles would be in sometime in March, and that the department is looking to outfit the cars with the proper police equipment. "They should be in by mid-to late-March," Helton said. "These are the radios that'll be installed in those two Chargers. "The other equipment is out for bid. We are still in the bid process because when we bid the cars originally, the two bidders didn't want to quote on the radios because they didn't have contracts on prices yet; so we have to do it separately." Helton said the radios were quoted at the state purchase price with a Motorola vendor for this area. The total is $6,826 for both radio units. The board unanimously approved the purchase. Purchase of the new Dodge Chargers that are on the way in was approved in late December, and they are being purchased from Ringgold's Mountain View Dodge Chrysler Jeep in the amount of $52,915. Catoosa County Attorney Clifton "Skip" Patty discusses tax commissioner writeoffs during Feb. 5's meeting. Colonnade Director Lora Ogden presents a licensing renewal to commissioners during the February meeting. Catoosa County officials have given the tax commissioner's office permission to write off certain delinquent accounts related to personal property bills. During the Feb. 5 Board of Commissioner's meeting, County Attorney Clifton "Skip" Patty explained Tax Commissioner Gary Autry's request to get some of those accounts situated. "What we have before the board is authorization to allow the tax commissioner to write off certain delinquent accounts on the personal property tax bills," Patty said. "This resolution would only apply to personal property, and it would apply in a situation where someone opens a business, either a corporate account or an individual account, a tax bill is generated, and then before that tax bill is paid, that business goes busted, the assets get repossessed by creditors, or the owner is not in the county and we can't collect the money from the owner." Patty explained that the delinquent accounts in question still reflect on the county's tax digest even though there's no resolution in sight. "In situations like this in the past that delinquency has just carried over from tax year to tax year to tax year, it's never collected and it's never going to be collected," Patty said. "It sort of inflates the digest by saying that we've got this money out there on our digest that we know we're never going to get." Per the resolution, Patty explained that the tax commissioner's office will have to deem the accounts as non-collectible moving forward. "It does require the tax commissioner to certify that it's not collectible," Patty said. "He can't collect it against the owner and he can't collect it against the property. The resolution would require the tax commissioner to investigate and require him to certify that he's determined that there's no property here that we can levy on, and also that the owner is not available to have a tax fee levied against them." The request was signed off on by the tax assessor's office prior to the meeting, and the Board of Commissioner's unanimously approved the resolution. In addition to the tax write-off, the board also approved a new contract for background music used at the Catoosa County Colonnade. Colonnade Director Lora Ogden presented the contract renewal to the board and explained what the license entails. "This is the ASCAP license renewal; this is an annual fee," Ogden explained. "The amount for this year has gone up just a little bit to $712, and that is based on the census data for Catoosa County. This licensing fee pays for the background music that we play for public events, special events, the background music in the hallway; it pays for background music when you put somebody on hold on the phone." 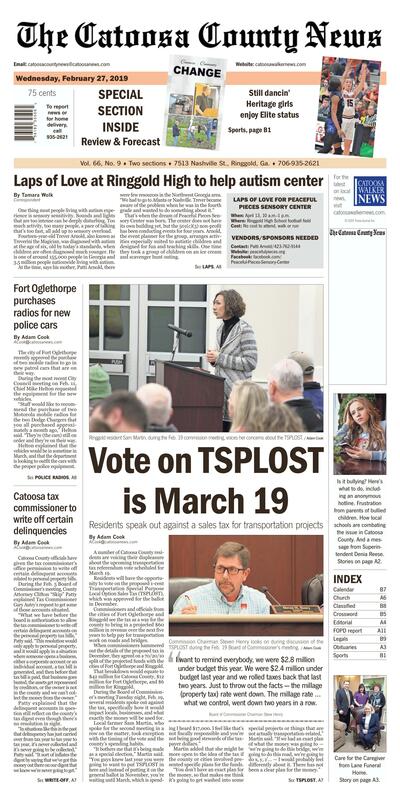 Ringgold resident Sam Martin, during the Feb. 19 commission meeting, voices her concerns about the TSPLOST. Commission Chairman Steven Henry looks on during discussion of the TSPLOST during the Feb. 19 Board of Commissioner's meeting. A number of Catoosa County residents are voicing their displeasure about the upcoming transportation tax referendum vote scheduled for March 19. Residents will have the opportunity to vote on the proposed 1-cent Transportation Special Purpose Local Option Sales Tax (TSPLOST), which was approved for the ballot in December. Commissioners and officials from the cities of Fort Oglethorpe and Ringgold see the tax as a way for the county to bring in a projected $60 million in revenue over the next five years to help pay for transportation work on roads and bridges. When commissioners hammered out the details of the proposed tax in December, they agreed on a 70/20/10 split of the projected funds with the cities of Fort Oglethorpe and Ringgold. During the Board of Commissioner's meeting Tuesday night, Feb. 19, several residents spoke out against the tax, specifically how it would impact locals, businesses, and what exactly the money will be used for. Local farmer Sam Martin, who spoke for the second meeting in a row on the matter, took exception with the timing of the vote and the county's spending habits. "It bothers me that it's being made as a special election," Martin said. "You guys knew last year you were going to want to put TSPLOST in here and instead of putting it on the general ballot in November, you're waiting until March, which is spending I heard $17,000. I feel like that's not fiscally responsible and you're not being good stewards of the taxpayer dollars." Martin added that she might be more open to the idea of the tax if the county or cities involved presented specific plans for the funds. "You don't have an exact plan for the money, so that makes me think it's going to get washed into some special projects or things that are not actually transportation-related," Martin said. "If we had an exact plan of what the money was going to — 'we're going to do this bridge, we're going to do this road, we're going to do x, y, z'... — I would probably feel differently about it. There has not been a clear plan for the money." Commissioners have not released or publicly identified specific plans for the money. They held town-halltype meetings in November and January regarding the tax and potential projects. Both of those sessions were sparsely attended by residents. Martin challenged commissioners to treat county funds with the same care she treats her family's budget. "I have these little envelopes (in my wallet). When we get paid, I put cash in them for groceries, animal care, the car and the house. ... When these envelopes are empty, I quit spending in that category," Martin said. "I have to budget everything. I should not have to budget any more than I'm already budgeting if you gentlemen cannot budget the county budget and get the spending under control. You're forcing me to control my spending more so that you can spend more on projects, and at the very least you could tell me what these darn projects are if you're taking money out of my household budget." Commissioners have spoken in recent months about how the TSPLOST is an alternative to increasing property taxes. During the meeting, Chairman Steven Henry defended that claim. "I want to remind everybody, we were $2.8 million under budget this year. We were $2.4 million under budget last year and we rolled taxes back that last two years," Henry said. "Just to throw out the facts — the millage (property tax) rate went down. The millage rate ... what we control, went down two years in a row." Former Fort Oglethorpe police chief and current Ringgold business owner Jeff Holcomb argued that his property taxes have increase in recent years despite that status of the millage rate. "Why haven't mine (property taxes) gone down," Holcomb asked. "Is my house the only one that has not had a tax decrease?" Holcomb also criticized the fact that the commission appoints the county's Board of Assessors. "You can say you've cut taxes, but I'll guarantee you the assessment has gone up, which you guys appoint," Holcomb said. "That right there is almost conspiracy like to me." Another point of concern for a number of residents is how the tax will impact the lower class and those on fixed incomes. Ringgold resident Sarah Wade pointed out that the biggest destination-type attractions retail-wise in the county are Costco or Cabela's, which she believes will put a lot of the burden on the residents who shop locally more consistently. "For people stopping by, they pick up one little thing and they move on," Wade said. "That's not going to generate that much income for the county. The ones who are going to be hit hardest by this tax are going to be the poor, those on fixed incomes and the elderly. You can't lay that burden on them. It's just not right." Mark Nollman, who owns North Georgia Gun Trader in Ringgold, said the tax could hurt his business and other. "I own a business here in Ringgold and the one thing that we fight every day is price — every single day," Nollman said. "For taxes to go up on a local level, it's going to decrease people spending money in our county. Watch businesses start leaving Catoosa County. ... It will happen." Commissioner Chuck Harris, who took office in January, reiterated that he's not in favor of the tax. "I'm not for any tax increase," Harris said. "I'm for the people voting for what they want. I will work with what I'm given." "The ones who are going to be hit hardest by this tax are going to be the poor, those on fixed incomes and the elderly. You can't lay that burden on them. It's just not right. "I want to remind everybody, we were $2.8 million under budget this year. We were $2.4 million under budget last year and we rolled taxes back that last two years. Just to throw out the facts — the millage (property tax) rate went down. The millage rate ... what we control, went down two years in a row.